Hamilton Insurance Agency was founded in 1938. We are proud to provide insurance and financial solutions to more than 7000 individuals. We are committed to building a solid relationship with customers through practical solutions and excellent service. We are a member of the Professional Insurance Agents Association of Ohio and Highland county chamber of Commerce. 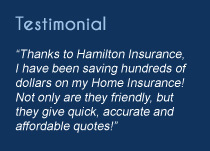 The agents at Hamilton Insurance Agency are independent insurance agents. As independent insurance agents, we don't work for any one insurance company; we sell coverage from serval different companies. This will allow us to focus on providing you with the right amount of insurance and the right type of coverage for your needs. Hamilton Insurance agency is a family owned agency that has been passed down from generation to generation. We strive to provide our community with the proper insurance coverage that they need. We hope to do business with you in the future. HAMILTON INSURANCE AGECNY is "Where service comes first"! !